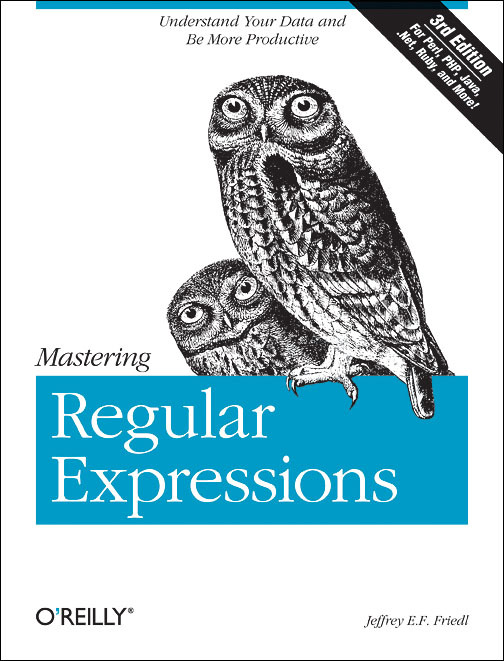 In the thousands of posts and many years I've had this blog, I've only ever mentioned my Mastering Regular Expressions book a few times, most recently perhaps six years ago when I announced that the third edition was complete and available. For those not steeped in computer science, despite the linguistic feel to the name, it's a computer book about a very thin slice of text-processing technology of interest to a certain kind of programmer. I don't generally mention it here because this blog is about me, and not about artificially fanning sales for something I did; I want the book to do well because folks that might find it useful actually find it useful. I guess I want it to do however well it does organically. The book has been well received these last 14 years, through three editions, and currently enjoys an excellent 4.5-star rating at Amazon.com, and 5-star ratings everywhere else I can find a rating online, such as in Germany, Japan, Korea, and Poland (though that last one seems to be out of a possible six). Besides those translations, it's also been translated into at least Chinese, French, and Russian, though I can't find ratings for those. The publisher doesn't tell me when they contract a new translation, so for all I know it's expanded further since I last checked several years ago. They also didn't tell me when they made an e-book version, but they apparently have because I've heard that the e-book version is currently on sale for half off along with other regex-related books at the publisher, O'Reilly Media. They asked me to help spread the word, and I figure that having written a technical best-seller that has stood the test of time garners me the right to toot my own horn once a decade, so here's this decade's toot: “regex e-books at O'Reilly half off until September 4th”. I have had your book since version 1. It has made regex available to me. I wasn’t very good at them and most other books made no sense. I can no longer count the number of times I have recommended your book to people. That is how I found your blog and from there I have come to share a love of photography which while no where as good as yours still brings me happiness. Feel free to toot your horn whenever you wish. Thanks for the great pictures and books over the years. Who gets to pick the animals on the cover? And does the owl signify “searching,” because it’s got those big eyes and hunts at night? A twittersearch verified that the toot was tweeted indeed! That’s because it’s a regular expression. I don’t think you can do that with a regular expression either. You need a CFG to match the two halves, right? Now I finally understand the url you use… regex.info. I am a big fan of regular expressions (and pretty bad at them). Will keep your book in mind for when I get stuck…..
You are a modern day renaissance man … what with regex, lightroom, photography, and life in Japan.